Hayate no Gotoku 6 – The Narrator’s Funny Again! The biggest news I seem to have about this fine episode is that the narrator’s sarcastic comments actually add something to the humor of the story. Rather than just commenting on the obvious (which the characters then comment upon in turn), the narrator actually gives perspective, albeit a jaundiced one, to what Hayate is thinking and feeling. I actually laughed at more than half his comments. Plotwise, this episode was nothing new (lead girls who can’t cook and the guy manfully accepting the dish anyway is a very old staple in shounen romance), though again the narrator gave it some extra humor. The turn that takes place at the reveals that the character-introduction mode of the show isn’t over yet. 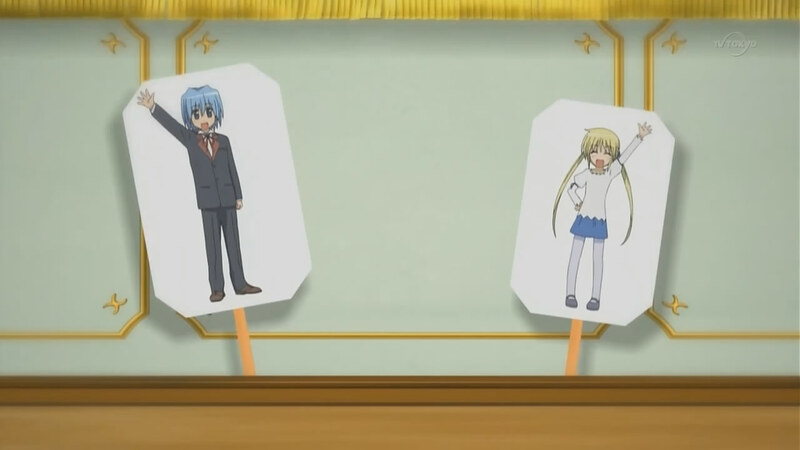 Question: does anyone know if the little paper-cutout thing at the end with Hayate’s image song playing is parodying or making fun of anything? It vaguely reminds me of the infamous episode of Kare Kano where the animation was replaced with crayon drawings glued to popsicle sticks. Or is it just one of those omake-type features every show has? I thought the paper-cutout thing was a cheap way for the animators to get out of the whole “this is all a flashback Hayate is relating to the giant robo in the first episode that wasn’t in the manga” subplot. 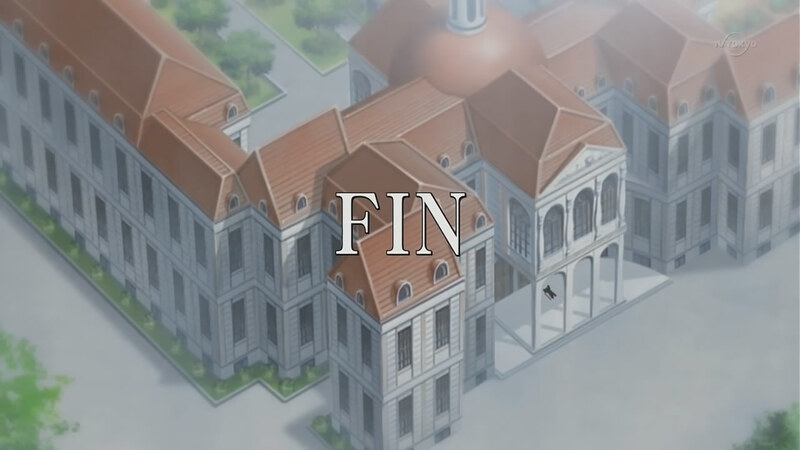 Umm I believe the end paper cut out thing is a parody of Marchen Awakens Romance’s version in which the dog and fairy (in paper-cut out and puppet form respectively) information network thing in which they explain the various Arms or something about the episode. As a side note the image songs (as I’m sure you’re aware by now)change depending on the guest *likes Hinagiku-san’s high-energy song the best* and there’s no image songs in the orginal that they’re parodying. That’s the most likely answer as they’re ALWAYS parodying or paying Homage to MAR look closly at the statues they’re various characters heads…and Babbo in one episode (The one where he goes out with the Kashmir..is that right doesn’t it start with a “c” *is blissfully unaware how to spell that word ^^* jacket and he just finished blocking the the amazing amount of crap trying to ruin it the first two people in the crowd are Ginta and Dorothy…also it’s called “Butler network” and the original is called “information network”. That was very informative, KuroTenshi. Thank you so much! I knew it had to be a reference to something, but I didn’t realize it was so close to the original MAR, down to the “Butler Network” name. Personally I thought I caught a Detective Conan reference in the statues, but I might be wrong.